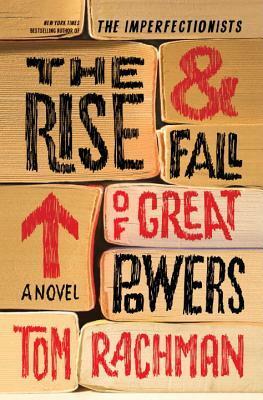 When I was on Goodreads, checking out Tom Rachman and his books, I read several comments suggesting that The Rise & Fall of Great Powers doesn’t measure up to The Imperfectionists, Tom Rachman’s first book. Well, if this is the case, then I better put The Imperfectionists on my to-read list, because I loved The Rise & Fall of Great Powers. I was thoroughly engrossed and entertained through the entire novel. It was fun, mysterious, and thought-provoking with a cast of wonderful characters. Tooly and her family and friends (likeable or not) were a joy to spend time with. I rooted for Tooly, while Humphrey stole my heart. I hurt for Paul, while I loved Fogg’s eccentricity and loyalty. Sarah made me cringe, while Venn had me wondering. I can’t say enough about these guys. I will miss reading about them. The story alternates between 1988, 1999, and 2011. There was some criticism of this style in a few of the Goodreads comments, but I thought it was well done, and necessary for the slow unfolding of Tooly’s life. As we go along, we gather more pieces of the puzzle, until we have a clear picture of events, as well as most of the characters’ background stories. As you read the story, you will be asking yourself many questions: Where is Tooly’s mother? What is the reason for Tooly and Paul’s way of life? How did she end up with Humphrey and Venn, and who are they? After two blocks, she halted, breathless and grinning because of her secret: that she had nowhere to run, no place to hasten toward, not in this city or in the world. All these people strode past with intent. Citizens had locations and they had motives, families, meetings. Tooly had none. Another thing I enjoyed about this novel, was not knowing where it would take me next. What piece of the puzzle will be revealed? Who am I going to learn more about? Where is Tooly’s life going to take her next? The characters is this book travel all over, and some have unique lifestyles, including Tooly herself. This was more than just a fun read. I quickly became emotionally attached to many of the characters, and wanted things to turn out well for them, while knowing that couldn’t always be the case. I was surprised by how touching some of the relationships were. Tooly was influenced in her life by varying people, and I think she surprises herself by her close attachment to some of them. So much of what Tooly thought, said, her mannerisms, attitudes, and humour, had come from Venn. There was no meaning to “Tooly” without him inside it. The two were akin: living among others but estranged from everyone, recognizing the pretense, forsaking a place of their own for the right, as Venn put it, “to relieve citizens of their transitory property.” He and she had no interest in riches, only in remaining free of the fools who reigned, and always would. This book could be looked at as a study of influences and relationships. Does life have meaning and worth when you cut yourself off from others? Is it even possible to cut yourself off from other people, while remaining among them? Tooly’s journey in the present is to re-visit the past, asking herself how she got to where she is today. Who held influence over her as she was growing up, and how? Armed with a clearer picture of her past, Tooly can decide how she wants her life to be in the future. She considered bookselling to be a terminal vocation. More discouraging to her was that the heavy-weights on these shelves held such puny sway. No matter their ideas and worth, they lived as did the elderly – in a world with little patience to hear them out. People kept their books, she though, not because they were likely to read them again but because these objects contained the past – the texture of being oneself at a particular place, at a particular time, each volume a piece of one’s intellect, whether the work itself had been loved or despised or had induced a snooze on page forty. Venn had a big influence on Tooly, and was very convincing. What would Tooly’s life have been like if she had stayed with Paul? Which life would you rather live; Normal, predictable, and stable? Or, chaotic, unpredictable and unstable, but with exciting adventures and greater freedom? What a lovely review and thank you for the nudge! I have The Imperfectionists on my iPad and had completely forgotten about it. It will definitely get moved up the list once I get my summer books done. This sounds like a really charming book. This sounds good. I’m not familiar with Rachman. It was good! And, I hear his first book is good, as well, but I haven’t read it. I’ll read more about him. I know- I was surprised by some of the Goodreads comments, which is why I talked about them in my review. I didn’t agree with any of the negative things they had to say. I guess everyone’s taste is different, but I have learned to take some of the Goodreads reviews with a grain of salt. I LOVE this cover. I ignore Goodreads reviews unless it’s a longer review explaining the pros AND cons of a book. I get so worked up sometimes, but if I’m interested in a book I’ll read it regardless of reviews. I’m so happy that you enjoyed the novel! Great review 🙂 For me, it’s been a mixed experience. I loved it in the start and found the different narratives to be a really good idea, but I’m around 200 pages in and I’m still so unsure of everything! I am so impatient to find out the truth that the path getting there is feeling longer and longer. I will continue to read it, but I hope to find the answers soon! Oh no. Keep going! Soon everything will be clear. I was impatient to find everything out, too, but didn’t ever feel compelled to skip ahead. I enjoyed every word. I’ll be anxious to hear what you think once you finish! Thanks! I hope to have it finished by Friday! This is a book I am VERY much looking forward to reading. Your review is making me think I should go pick it up today, actually. You write excellent reviews and always pick the quotes that make me get very excited about a book. And I look forward to pondering your questions about relationships, identity and meaning while reading. I can’t wait to get started on this one!! Thanks for the compliment! If you are excited about pondering, then you will like this book (I hope!). I would love to ponder with you when you’re done. After all, that’s why I’m doing this! P.S. You don’t have to think deeply about this book to like it, but thinking deeply about books makes them more fun to talk about! You are sooooooo going to enjoy The Imperfectionists! I can’t wait to get my hands on this book, I just can’t say enough great things about the perfect read that was The Imperfectionists. The structure of this story sounds quite similar with a big cast. And Tooly’s life sounds like my ideal scenario actually so if I can’t have it, I’m excited to read about it. Now I want to read The Imperfectionists immediately! Hopefully you won’t find this one doesn’t measure up, like some of the people on Good reads. But I can’t imagine not liking Tooly and friends. You should do a Tom Rachman double header! I always enjoy stories that are set in bookstores, and Venn’s quote about loneliness sold me. This sounds wonderful. I will look it up! Venn’s whole outlook on life was almost cultish, except that he didn’t believe in getting too involved with people. So, it was like a cult of one. It’s a fun story on its own, but it also gives you things to think about. I really liked The Imperfectionists and would gladly read another by this author. Okay, why have I never heard of this book or this author? I love the sounds of this… I’ve shied away from some of the popular “books about books” that are popular lately, took much hype, but this sounds less… Cutesy I guess. Despite the cutesy character names! I actually ended up liking this more than I thought I would. I just thought it was really fun, and there was more to it than I thought there would be. Most of the book references are of the Great Thinkers that Humphrey likes to read, and of which I have never read any. It did make me want to read Nicholas Nickleby, though!